I watched a very compelling Australian Open tennis match last night between Serena Williams and Sloane Stephens. I’ve watched over a decade of excellence, and drama, from Serena. She has been brash and humble, rude and gracious. She has battled injuries and the strain of a too-long tennis calendar for almost 18 years while amassing career tour earnings over $40 million dollars! That does NOT include endorsements. Serena Williams is incumbent tennis royalty – the undisputed queen of women’s tennis! On the other side of the net was the young upstart Sloane. As a long-suffering US tennis fan, waiting for that “next great” to take the place of Sampras/Agassi/Courier/Chang and the Williams sisters, Sloane has been refreshing. I can see why she claims Serena, Venus Williams, and Kim Clijsters as role models. She has the raw power of Serena, the grace and range of Venus, and the perseverance and defense-to-offense mentality of Clijsters. Sloane Stephens has all the tools – to be a challenger to the throne! In professional tennis matches between champions and teenaged challengers, the champions frequently break the confidence of the challenger quickly. In fact, Serena had not lost more than 3 games in a set at this Australian Open. 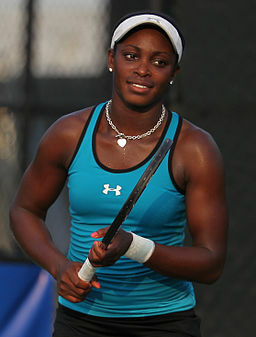 Sloane not only held her own, she didn’t lose a point on her own serve for the first three games. Then…she blinked! She got down 0-40 on her 4th service game and was eventually broken. Serena served out the set to win it 6-3, and announcers began to wonder if this would be a routine beatdown by Serena. Moral: Don’t blink! If you are holding your own against an incumbent competitor, derive confidence from it. Trust in your tools, and do not let doubt creep in to your thoughts. YOU BELONG! Serena won the first two games of the 2nd set, and it was looking bleak for the challenger. However, Sloane did break back and Serena sustained an injury to her back. Serena could barely move, and her invincible serve disappeared. As much as I hate taking advantage of an injury, all Sloane had to do was get her returns in play and make Serena cover a lot of court. So…Sloane got tight! She badly missed returns, mishit balls off of her frame, double-faulted multiple times, and put the ball right in Serena’s “wheel house”. Serena could not move, but she is lethal if she gets a racket on the ball because she is still the most powerful tennis player in the women’s game. Sloane saw the opportunity, and she began to choke. To her credit, she did just enough to survive and win that 2nd set 7-5. Moral: Don’t choke! When you realize the competition is “on the run” and wounded in some way, you must grasp the opportunity. Do not abandon your fundamentals, over-think your strategy, or lessen your efforts because you think “I’ve got this”. Incumbents are successful because they’ve been there. They know how to persevere and how to adapt when Plan A fails. The muscle relaxants kicked in, and Serena was back to serving at 118 mph and moving well. If the upstart Sloane Stephens was going to win, she was going to have to trust her tools and forcibly TAKE the victory. The quality of the tennis match improved dramatically as both players hit winners from all over the court. Sloane showed remarkable defense, and she unleashed her full arsenal of versatility with volleys, screaming winners, and thoughtfully constructed points. Serena was Serena – incredible power with a champion’s heart on full display. Serena may not have been at full capacity, but Sloane truly WON that 3rd set to win the match. Moral: If you stumble and fall, get back up. If you make a mistake, own it without beating yourself up about it. Get back to your winning ways and resolve to compete at a level you can respect and never regret. At the post-match interview, Sloane was her typically engaging and gracious self. She complimented Serena, and she enthusiastically welcomes the next challenge. However, she said one thing that concerned me: she said she didn’t let Serena’s condition affect her play, and she just tried to play her game. Moral: In any retrospective, be honest with yourself. Serena’s compromised physical abilities did affect Sloane’s game. She needs to acknowledge that impact and then learn from it. True champions do! Are you enjoying the Australian Open? Who is your favorite player? And do any of these morals apply to your own career or competition experiences? Brian, great post. I would add to challenge the status quo and take some risks if you expect to win when competing against a strong incumbent. Had Sloane played it safe by counter-punching from the baseline, Serena would be in the semis… Instead, she took some risks by approaching the net (even in the face of Serena’s power) winning 18 out of 20 net points! Think of how many times upstarts in business, by being brash and taking some risks, achieved phenomenal success. Apple, of course, comes to mind. Rather than playing it safe by conforming to the tech ideology of the day, Steve Jobs took many risks in realizing his vision of personal computing that eventually upset the strong incumbents of the day (e.g., Atari and HP). Absolutely great point, Steve. Challengers will NEVER ascend unless they are willing to take risks. They have to be disruptive and opportunistic – just like Sloane was with her volleys. Even then, she prepared for that calculated risk with hours of practice. She may have been taking a risk, but she was NOT unprepared.